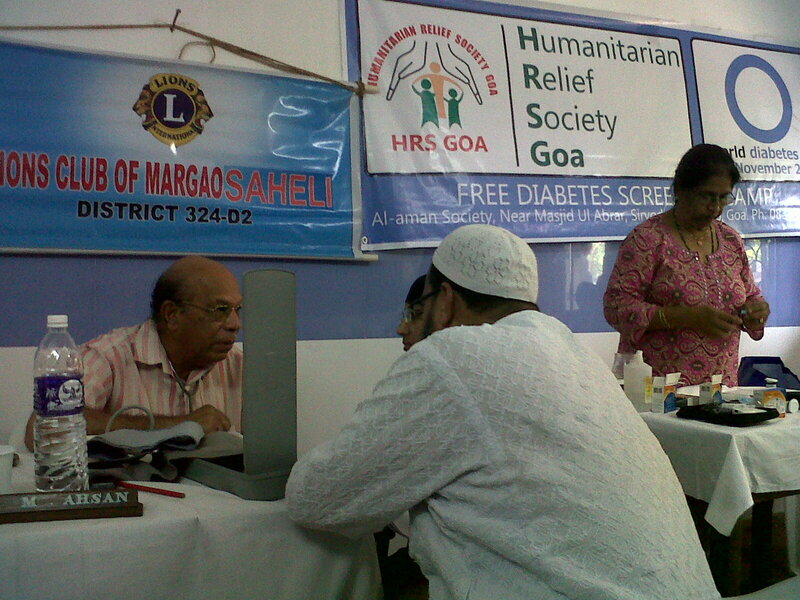 Margao:- 14.11.2004 – A free diabetes Screening camp was organised by Humanitarian Relief Society (HRS), Affliated to Jamaate Islami hind Goa, with the help of Lions Club of Margao on 14.11.2012 from 9 am to 12 noon. The Camp was attended by 55 people from the surrounding area. After the warm welcome and prayers, the camp was inaugurated by Mrs Tabassum Sattar, president of womens wing of jamaate islami hind, margao Unit. In her inaugural address, she emphasised the importance of holding such camps to bring awareness among the people about diabetes. She said that diabetes was one of the major challenges of this generation and the generations to come. She then introduced the doctors to the camp delegates. Mrs and Mr M Ahsan volunteered to be the doctors for the camp. The camp was conducted with 2 doctors and few volunteers. Many people who were unaware about the diabetic status were surprised to know they had diabetes. The delegates were checked for their blood glucose and the reports were given to the patients for future references. The delegates were given free consultancy and prescription. Mr Asadullah Khan, president jamaate islami hind margao unit, concluded the camp with the vote of thanks. Mr Abdul Wahab, secretery Humanitarian Relief Society, Mr Mohammed Imsail, Humanitarian Relief Society Margao Unit incharge, Mrs Saira banu, All Goa womens wing organisor were also present during the camp.